Nikki Grimes returns to the Bronx in Between the Lines, the sequel to her Coretta Scott King Award-winning book, Bronx Masquerade. Give us a quick elevator pitch about what your new novel ‘Between the Lines’ is about. A diverse group of high school students explore the inner landscape of their lives through poetry. As their class prepares for an end-of-term poetry slam, the students discover they are more alike than they are different, and learn to respect that each of us has a story to tell, and challenges to face in life, no matter our race, origin, or circumstance. ‘Between the Lines‘ is a companion novel to your Coretta Scott King Award-winning book ‘Bronx Masquerade’. What inspired you to continue telling stories in this world? There were more stories to tell, both new and old issues to explore that are impacting the lives of young people today. I’m talking about issues like immigration and criminal justice, or the lack of it. I wanted to tell those stories and this particular classroom setting – where poetry was at play and students were encouraged to dig deep – seemed a perfect world in which those stories might emerge. You’ve written over 50 books in your career and have received the Laura Ingalls Wilder Award for your substantial and lasting contributions to children’s literature. Now that you’re so experienced, what is your method for approaching each new book? Is your writing approach different than when you first started writing? The fact of having a process, itself, is what’s different. In the early days, my work was scattershot. I was still finding my way, whereas now, I have a proven approach, a reliable process for working through each project. That’s what’s different. I approach each work as I would a jigsaw puzzle, concentrating on the individual pieces first. I do have a skeletal framework in which to set them, but my process is not linear, or sequential. I write as it comes, then figure out how the pieces fit together. Once I’ve assembled all the pieces, the puzzle is done. You’ve said that you consider yourself to be more of a poet than a storyteller. What do you believe distinguishes the two from each other? When I think about storytelling, words like “plot” and “story arc” and “resolution” come to mind. But when I think about poetry, my focus is on painting a picture with words and imbuing them with emotion. The emotional power of poetry is its hallmark. Obviously, I lean more towards narrative than lyrical poetry, and so that allows me to bridge the poetry/storytelling divide. As someone so well versed in children’s literature, what are some of your favorite young adult novels or authors that you would like to share with us? I’m happy to say there are many, but I’ll just mention a few: Renee Watson’s Piecing Me Together, Mariko Nagai’s Dust of Eden, Jewell Parker Rhodes’ Ghost Boys, Julie Chibbaro’s Into the Dangerous World, Gary Schmidt’s Out of Orbit, Willow by Helen Frost, My Name Is Not Easy by Debby Dahl Edwardson, and anything by Naomi Shihab Nye, Gary Soto, Joseph Bruchac, or Jason Reynolds. Darrian has big dreams of being a journalist. To hone his skills and learn more about the power of words, he enrolls in Mr. Ward’s class, known for its open-mic poetry readings and boys vs. girls poetry slam. Everyone in class has something important to say and in sharing their poetry. Whether it is health problems, worries about aging out of foster care; being bullied for religious beliefs, or having to take on too much responsibility because of an addicted parent, each kid has a story to tell. As Darrian and his classmates get to know one another through poetry, they bond over the shared experiences and truth that emerge from their writing, despite their private struggles and outward differences. 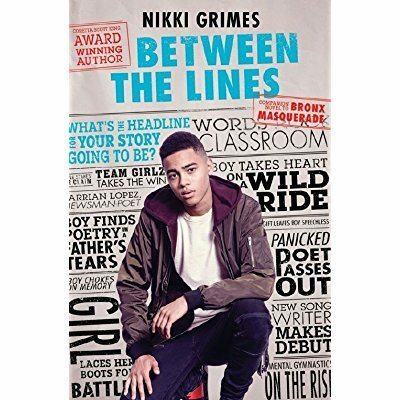 Between the Lines by Nikki Grimes debuts on bookstore shelves Tuesday, February 13, 2018. You can order the book from Amazon, Barnes and Noble, or your local independent bookstore. Will you be reading ‘Between the Lines’?